A combined ALMA and Very Large Array (VLA) image of the galactic center. The supermassive black hole is marked by its traditional symbol Sgr A*. 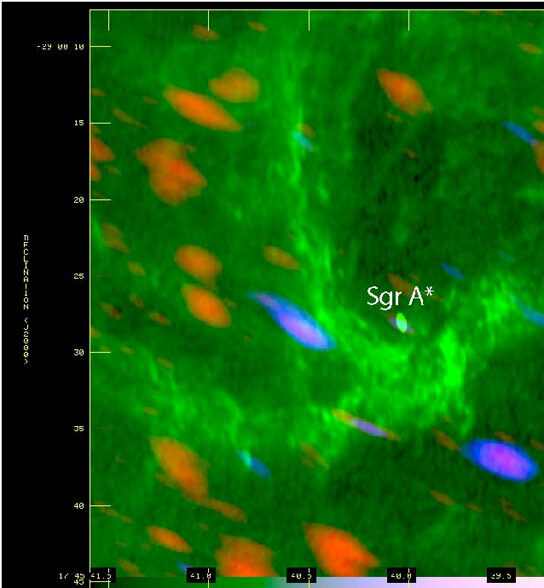 The red and blue areas, taken with ALMA, map the presence of silicon monoxide, an indicator of star formation. The blue areas have the highest velocities, blasting out at 150-200 kilometers per second. The green region, imaged with the VLA, traces hot gas around the black hole and corresponds to an area 3.5 by 4.5 light-years. Credit: Yusef-Zadeh et al., ALMA (ESO, NAOJ, NRAO), NRAO/AUI/NSF. Using ALMA, scientists have detected signs of star formation near the supermassive black hole at the center of the Milky Way Galaxy. Astronomers using the Atacama Large Millimeter/submillimeter Array (ALMA) have discovered signs of star formation perilously close to the supermassive black hole at the center of the Milky Way Galaxy. If confirmed, this would be the first time that star formation was observed so close to the galactic center. The center of our galaxy, 27,000 light-years away in the direction of the constellation Sagittarius, is home to a monstrous black hole with a mass of four million suns. Extending outward from this gravitational behemoth for many light-years is a turbulent region of space that is thought to be wracked by such extreme tidal forces that any star-forming clouds of dust and gas would be stretched thin and shredded long before infant stars could emerge. Yet against these extreme odds, ALMA spotted telltale jets of material bursting out of what appear to be dense cocoons of gas and dust. These jets, if they were observed in more placid surroundings, would indicate the formation of a young star. The results were accepted for publication in the Astrophysical Journal Letters. Yusef-Zadeh and his colleagues speculate that these molecular clouds have become so massive and dense, possibly by colliding together, that they cross the all-important threshold that allows internal gravity to take over, starting a chain of events that inexorably leads to the birth of a new star. As this process evolves, material in these clouds clumps together and collapses into an ever denser mass that begins to rotate faster and faster. This rapid rotation, possibly coupled with the star’s magnetic field, accelerates some of the material and shoots it out into space along the nascent star’s axis of rotation. The astronomers were able to detect these characteristic jets of material by tracing the presence of the molecule silicon monoxide (SiO), which is relatively abundant in molecular clouds. When excited during star formation, SiO emits a very specific set of wavelengths of light in the microwave, or millimeter range. This is precisely the window of light that ALMA was designed to study. These results were part of the ALMA Science Verification program. The data were taken with only 12 of ALMA’s eventual full complement of 66 antennas. Earlier data from CARMA, the Combined Array for Research in Millimeter-wave Astronomy, contributed to this research. Be the first to comment on "Signs of Star Formation Near Supermassive Black Hole at the Galactic Center"